This Lentil Pasta Salad with Broccoli uses pasta made from lentils. It’s a simple, healthy, and delicious recipe! 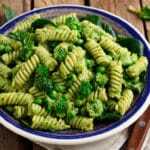 I really love this healthy version of a traditional pasta salad, with crisp, crunchy broccoli to compliment. The dressing is a simply blend of avocado oil and fresh lemon juice. Now that I have a gluten-free pasta brand that I’m head over heals in love with, I’m making all kinds of pasta salads this summer. This Lentil Pasta Salad with Broccoli recipe includes the fresh flavors of lemon, avocado, and broccoli florets for a crisp cold salad that can be lunch or dinner. 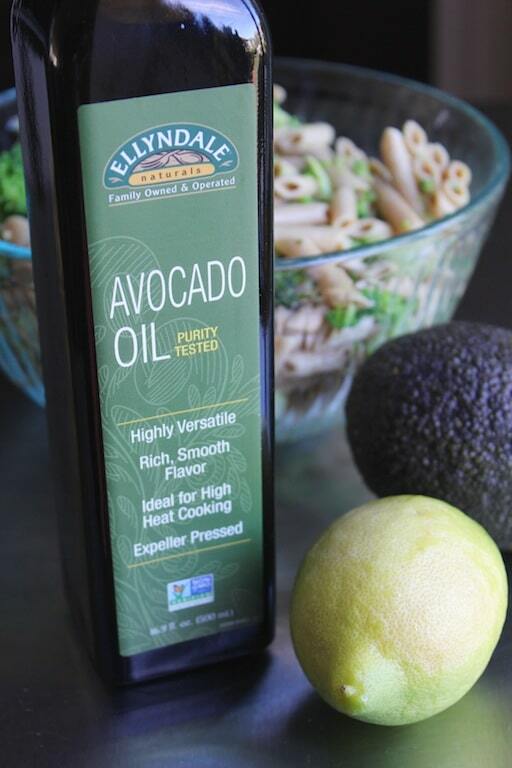 This recipe also highlights another new-to-me ingredient that I received from my friends over at NOW Foods: avocado oil! 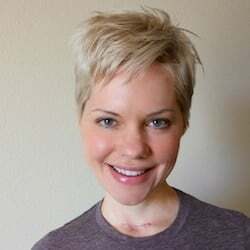 The brand is called Ellyndale and it’s a line of organic, non-GMO, natural products. Avocado oil is great because it can be used for baking and at high temperatures, or used raw in a salad like this. 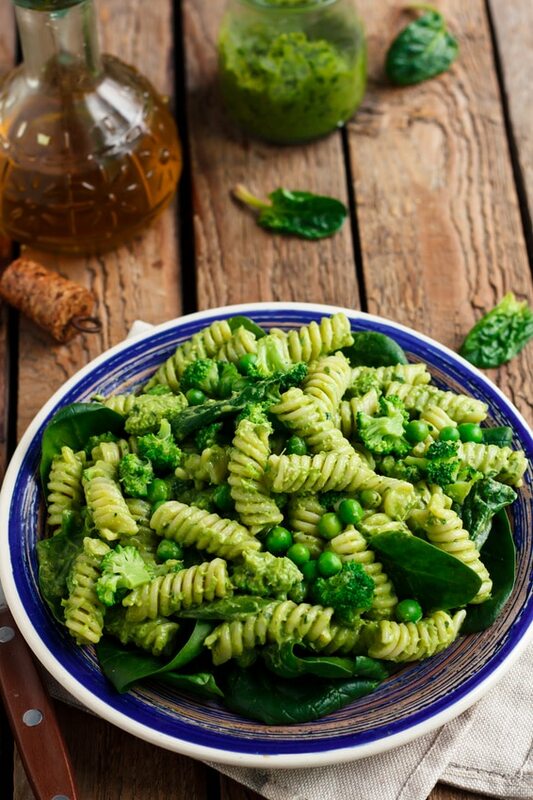 You don’t need a lot of oil for this recipe, but it sure helps the pasta keep from sticking together and enhances the lovely flavor of avo, plus helps make the broccoli go down, ha ha. Feel free to use your favorite oil; extra-virgin olive oil is perfect for this recipe, too. Freshly squeezed lemon juice plus the zest just adds brightness and also helps keep the broccoli nice and green. Lentil pasta is really unique because it ends up being a high-protein meal that is 100% plant-based. The texture is almost identical to wheat pasta and is superior to other gluten-free pastas I’ve tried. I have varying tolerance to legumes, but my stomach does surprisingly well with lentils, and recent food sensitivity testing showed no immune reaction to lentils. Woot! My fav lentil pasta brand of all that I’ve tried is from a company called Tolerant. Lentil Pasta Salad with Broccoli is a great summer or potluck dish that can be a side or main dish. Cook the pasta according to the directions on the package. Drain and rinse and pour into a large mixing bowl. Toss with avocado oil to prevent sticking. Add the cubed avocado, lemon zest, lemon juice, and steamed broccoli florets, and stir well to combine. Pour the green peas on top for extra color (optional). To steam the broccoli florets, simply place them in a glass bowl with a tablespoon of water. Cover with plastic wrap and poke a few holes in the top. Microwave for 2 minutes. Or, steam on the stovetop using a steamer basket for 3 minutes. I hope you’re having a great summer and staying cool. It’s been a hot one so far, even here in California where we generally have mild summers at the beach. Carrie, you weren’t kidding about that Tolerant Pasta!! I won it in your giveaway and made it twice this weekend. I cannot believe they were able to make a 1 ingredient “bean” pasta taste so amazing. And it’s so filling and blood-sugar stabilizing 🙂 They definitely won me over and gained a new customer. Thanks again! Oh yum! 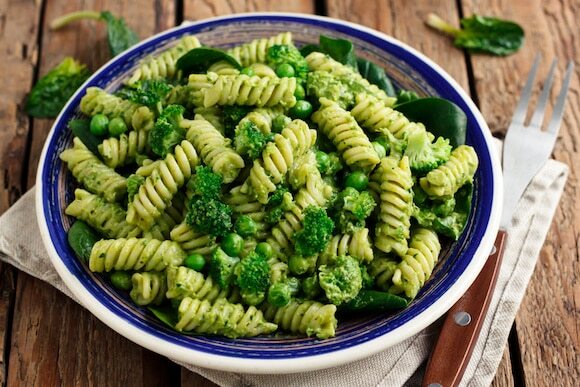 Perfect summer food =) Love the combo of the avocado & broccoli with the pasta. I still haven’t tried that brand of gf noodles yet… is it at Whole Foods by chance? Combination of avocado and broccoli sounds delicious! This is one of my favorite summer dishes.